Michael Keaton is one of the best actors of the last century and was completely robbed of an Oscar for his role as ‘Beetlejuice‘. He’s proved countless times that his talent knows no bounds. 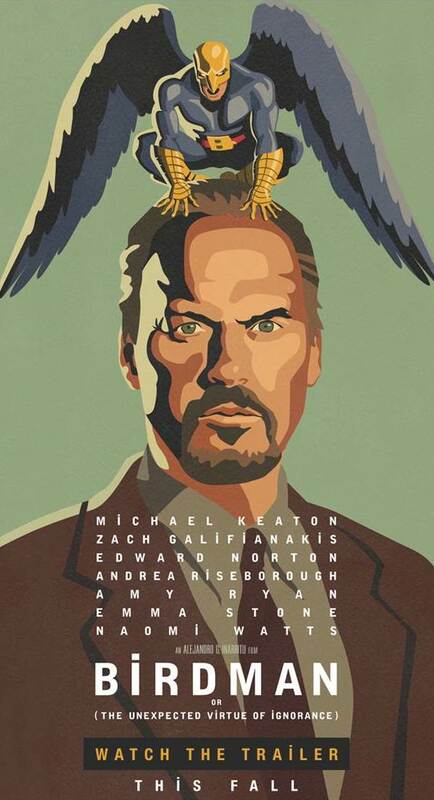 His new film is called ‘Birdman‘ and looks all sorts of awesome. In the film, Keaton plays an actor who is famous for playing a superhero. He is now trying to book a gig on Broadway. In the days leading up to opening night, he battles his ego as this superhero to get back his sanity, career, and family. The film was directed by Alejandro Gonzalez Inarritu. He directed ‘21 Grams‘, ‘Amores Perros‘ and ‘Babel‘ to name a few. The film looks absolutely gorgeous, and I can see this one winning awards for Cinematography at some point. Plus, we get to see a former Batman fight a former Incredible Hulk. Enjoy the trailer. ‘Birdman‘ will be released October 17th and co-stars Edward Norton, Zach Galifianakis, Emma Stone, Naomi Watts and Amy Ryan. This entry was posted on Thursday, June 12th, 2014 at 1:13 pm	and is filed under Film, News. You can follow any responses to this entry through the RSS 2.0 feed. You can skip to the end and leave a response. Pinging is currently not allowed. « Watch Seth Rogen and James Franco Search for Kim Jong-un in their new Trailer ‘The Interview’! !